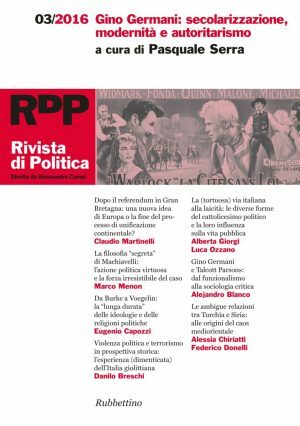 dossier: il potere appartiene al popolo? argues that the very idea of constituent power is a typically modern principle of limited government. From antiquity up until the 20th century, religion has played an important role in foundational moments of political systems. From the USA to the Federal Republic of Germany, when “we the people” have set up institutions to govern themselves, reference to religion seems to challenge the secular character of the self-rule of the people. At the same time, the role of religion in expressions of people’s power seems to be a neglected issue in contemporary democratic theory. This paper addresses this lacuna by asking the question, what is the relation between people’s power and religion in Rawls’democratic theory? It argues that “the people” have become part of a liberal myth that substituted the divine right of kings to legitimise liberal democracy. Moreover, the paper demonstrates that religious considerations of “the people” are marginalised in the exercise of constituent power in the four-stage sequence in Theory of Justice. 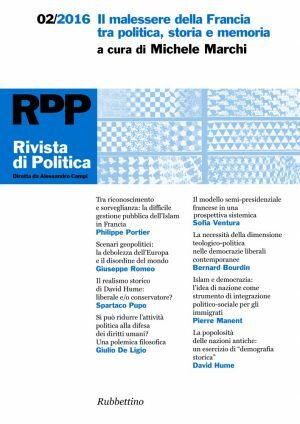 Finally, the paper argues that the Rawlsian idea of public reason restricts the possibilities of religious people to equally exercise people’s power through communicative acts in the public sphere. nonetheless, the advantages of representative government over direct democracy. Marie-Hélène Caitucoli, The French constitutional Council legitimacy process (1958-1986): where is the people? Modern democracy is about representation and election of the citizens’representatives. The citizens consent to respect laws made in their name by their representatives. Thus, democratic legitimacy secures equal participation to the law-making process through elections. Nevertheless, constitutional Courts composed of non-elected members can interfere within this process through a judicial review that can invalidate laws approved by the representatives. Understanding what grounds their legitimacy highlights some non-explicit features of representative democracy. The empirical and original material used in this research is composed of written secrete deliberations of the French Constitutional Council (CC) from 1958 to 1986. The analysis of these deliberations revealed two main findings. It showed that there has been a progressive practical shift in the concept of democratic legitimacy in France, and the article discusses its key features. It also opened space for a reflexion on how to make this new version of legitimacy fit in with the consensual definition of modern democracy discussed above. 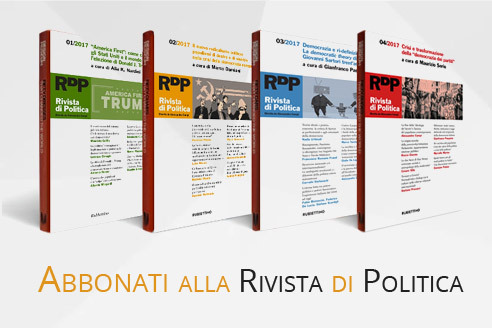 Traditionally, the powers of war and peace have remained a stumbling block in the development of representative democracies: they have been discretely but steadily placed out of people’s reach, to the advantage of “governo stretto”, “royal prerogative”, “Raison d’État”, or, more recently, “presidential dictatorship”. At the end of the 18th century, though, American and French revolutionaries struggled to re-allocate war powers in accordance with the principle of popular consent. If partisans of strong executives managed to preserve some diplomatic and military room, the first American and French constitutions gave parliaments the concurrent powers of declaration of war, oversight of military operations and peace treaty-making. Therefore, American and French constitutional assemblies claimed that no war should be declared in representative regimes without the consent of popular assemblies. In a Kantian perspective: when the concurrence of all political bodies is requested prior of any decision leading to war or peace, royal prerogatives shall no longer exist. In the seventies Gianfranco Miglio conceived the project of a synthesis between “natural sciences” and “human sciences”. 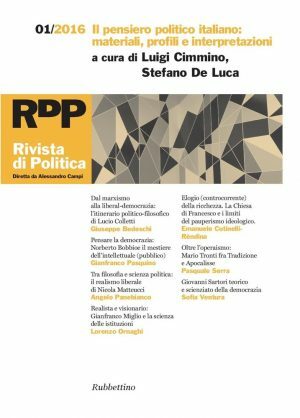 For the Italian political scientist, disciplines such as ethology, sociobiology and biopolitics could give a solution to the old project of (classical) political realism of founding the study of “regularity” in politics on a more systematic and complete knowledge of the “human nature”. This article examines Gianfranco Miglio’s interest in these disciplines, with the aim of emphasizing the aporetic tension – between the two polarities of “nature” and “culture” – that marks each theoretical project that tries to find in the “natural science” the basis for the confirmation of the classical image of anthropological pessimism. In particular, the article argues that the tension between nature and history can paradoxically lead to forget what specifically characterizes the ‘Political’. 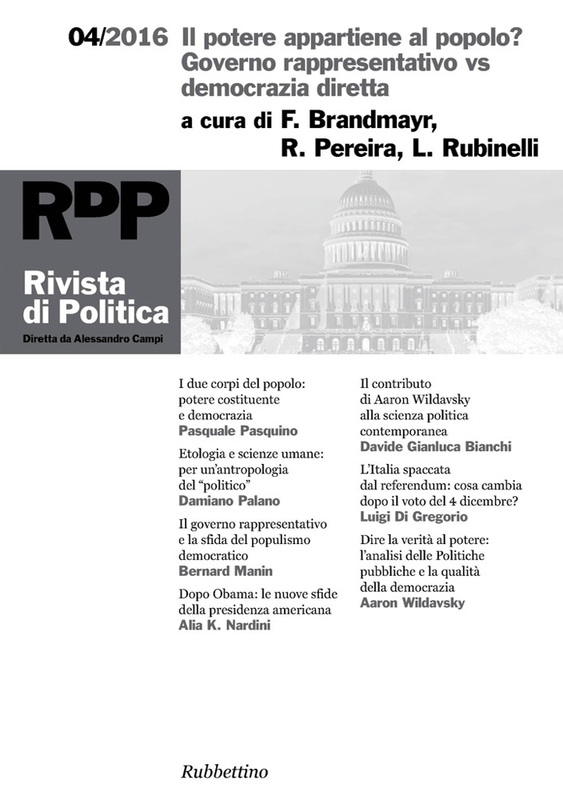 Davide Gianluca Bianchi, Public policy analysis and democracy: a possible relationship? Speaking Truth to Power (1979) is a collection of lessons which Aaron Wildavsky learned from those he considered his masters: the students of the Graduate School of Public Policy at Berkeley. It is therefore the primary intellectual legacy of one of the classics of political science, perhaps the most important “second generation” spokesperson among the founders of policy analysis. A scholar of Public Administration, he was influenced mainly by Woodrow Wilson (1856-1924) and Herbert Simon (1916-2001). His studies focused primarily on the formation processes of public budgets, founding the incremental approach, and on the implementation phase of public policy, paving the way for implementation research. His reflections somewhere between political science and anthropology are particularly inspired, seeking a “democratic” status to be assigned to policy analysis. Given that any abstract definitions of the discipline would be difficult (and of little practical use), the essay considers briefly the technical tools of policy analysis – qualitative political theory, quantitative modeling, systematizing guesswork, micro and macro-economics, organization theory, self-correction of errors – and then focuses its attention on the implementation stage of the policy cycle, the importance of which is generally underestimated. Regarding this, citizens can make an important contribution, because it is more probable that they are able to change public policy than that the government changes its behavior: this circularity is the moral component of policy analysis. By contrast, the government is often overshadowed by the unintended consequences of previous policies. Rather than define it, it is more useful to ask what policy analysis actually does. It deals with problems which deserve to be solved, teaching people to have realistic expectations. The end result is undoubtedly important in public policy, but so is the process. The originality – the creative discovery – is relevant, but the scientific arguments made in favor of the various policies – the technical justification – are no less important. The essence of policy analysis is to recognize and to correct errors, by using a method that is not simply economic rationalism. But recognition and correction are not always compatible: a big mistake is easily identifiable, but difficult to correct, because of the effects produced. However, to recognize errors is essential, because in a democracy this is the engine of change.